This region of Anatolia was conquered by the Turks at the beginning of the 11th century. 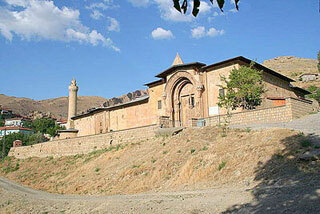 In 1228-29 Emir Ahmet Shah founded a mosque, with its adjoining hospital, at Divrigi. The mosque has a single prayer room and is crowned by two cupolas. The highly sophisticated technique of vault construction, and a creative, exuberant type of decorative sculpture - particularly on the three doorways, in contrast to the unadorned walls of the interior - are the unique features of this masterpiece of Islamic architecture. This article uses material from UNESCO World Heritage List article "Divrigi", which is released under the Creative Commons Attribution-Share-Alike 3.0 IGO License.